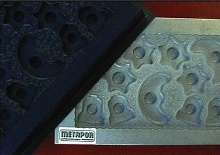 METAPOR materials are based on formulation of metal or ceramic powders and epoxy binders. They are highly machinable and produced in plate form in range of standard sizes. METAPOR BF 100 AL is aluminum based and offers temperature resistance up to 230Â°F. METAPOR BF 210 AL is aluminum based and can be used in temperatures up to 460Â°F. METAPOR MC 100 AL is aluminum based and highly porous. METAPOR CE 100 WHITE is ceramic based for humid or wet environments. STUDIO CITY, CALIFORNIA: June 27, 2002: PORTEC - North America, a division of NEST Technologies, Inc., announced today new METAPOR porous materials for applications related to material handling. These applications include vacuum clamping tables and chucks, air-cushion devices, and powder fluidization systems. Since its initial introduction in 1996, METAPOR micro-porous materials have gained popularity in the plastics industry mainly for production of air-permeable tooling for thermoforming processes. METAPOR is now widely used to make molds for production of rigid plastic packaging as well as components for automotive interiors, equipment enclosures, and other industrial areas that use vacuum formed plastic parts. Over the years engineers from numerous industrial fields have also been applying METAPOR products to situations requiring even clamping forces using vacuum as well as even cushion forces using air pressure. The ever increasing number of these applications and specific customer requirements have led to this introduction of METAPOR porous metals and ceramics for a wide range of material handling applications. METAPOR make it highly machinable without affecting its air-permeability, and multiple pieces are often joined together to create large porous structures. At this time the most common material handling application for METAPOR is vacuum clamping. In the electronics industry METAPOR based systems are used for accurately holding down printed circuit boards, semi-conductor wafers, liquid crystal displays, and other delicate components. General machining and manufacturing industries use METAPOR to build flat and 3-D vacuum chucks in order to clamp parts for machining, trimming, assembly, and numerous types of other processes. In the medical industry, vacuum systems utilizing METAPOR are used for handling films, tubing, and other delicate materials. structures it fluidizes the powder materials enabling easy powder transport for packaging, controlled feeding, and dispensing. This product offers fine surface finish, good mechanical properties, and temperature resistance of up to 230 degrees F. For vacuum clamping, this material can create a build-up of internal pressure allowing for adequate clamping of delicate components even though the complete holding surface may not be covered. This product has similar properties to METAPOR BF 100 AL, however, it can be used in high heat environments reaching temperatures of up to 460 degrees F.
This product offers 8 times higher air throughput than METAPOR BF 100 AL. This material is often used for construction of 3-D and flat vacuum chucks for machining, trimming, and assembly processes. This product is applicable for humid or wet environments as well as for clean rooms and other special applications. This product offers higher hardness and better abrasion resistance than other METAPOR products. Product: Flat vacuum chuck for machining thin walled & flexible components. of the aluminum air plenum structure. Horst Witte of Germany is a leading manufacturer of technological equipment and products for vacuum clamping applications. Some of its products utilize METAPOR porous materials as a component within the vacuum clamping system. Horst Witte supplies turnkey vacuum clamping solutions to numerous industries including aerospace, automotive, medical, electronics, etc. IBAG - North America is an established supplier of vacuum workholding systems for precision machining and high speed machining equipment. IBAG - North America offers engineering application assistance related to vacuum workholding systems and high-speed spindles.